Love the clean, simple look. 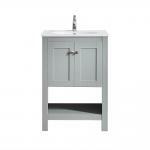 Vinnovas Grant Vanity adds understated elegance to a smaller bathroom. The cabinet offers concealed space for toiletries, while the lower bay lets you personalize the piece with your favorite decorative items. WARNING! WARNING: This product can expose you to chemicals including [name of one or more chemicals known to cause cancer, name of one or more chemicals known to cause reproductive toxicity, or name of one or more chemicals known to cause both cancer and birth defects or other reproductive harm], which is [are] known to the State of California to cause cancer or birth defects or other reproductive harm. For more information go towww.P65Warnings.ca.gov/furniture.